On October 26, 2006 on a stage at the Enterprise Architectures Conference at the Hotel del Coronado, the formation of a unique EA mentoring company called EAdirections was announced. The founders, Larry DeBoever, George Paras and Tim Westbrock wanted to bring their experience from The META Group as Enterprise Architecture analysts and provide a more client-focused interactive service to those in need of improving their effectiveness with EA, strategic planning, portfolio management, governance and other related disciplines. Sadly, the world lost Larry last year to a battle with cancer, but his encouragement, brilliance and charisma remain a part of who we are. Ten years later, after working with dozens of companies, we have seen a lot of good and some not so good developments related to Enterprise Architecture. 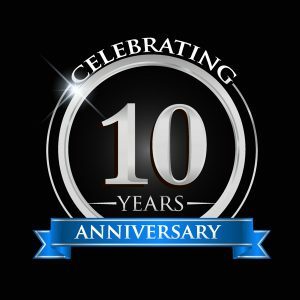 In recognition of those 10 years, those dozens of companies, and continued success, we would like to share them with you. When we started, many times we helped companies build the case for the EXISTENCE of EA teams. Now, it is uncommon to run across a medium to large company without an EA team. Our most common interactions involve helping companies improve their effectiveness; build a case for doing more strategic work, and increasing their coverage beyond traditional IT domains. True-EA, which we define as having business domains (activity and information) owned and led by business professionals and IT domains (data, application and infrastructure) continues to be overshadowed by the more IT-centric view of Enterprise Architecture. Business architecture is up, information architecture (data arch) still down, technology architecture stable, and application architecture is many things – part info, part integration, part development patterns, part inventory/portfolio. Technology continues to change at a rapid pace, but has little impact on the APPROACH to EA (maybe more pressure for smaller planning cycle) only the CONTENT of EA. The conflict between project and enterprise views remain as strong as ever. More corporate executives are challenged by large-scale transformation and are realizing that EA, or something like EA, is necessary for success. Recognition of the value of business architecture, specifically with regard to capability maps, has increased dramatically. But – recognition that it is an integral part of Enterprise Architecture has been lost in the hype. Instead, business architecture proponents are marketing it as an entirely new and distinct “next big thing”. Despite increasing awareness of business architecture, most EA groups are reactive and primarily supporting project delivery/technology as IT Architects. Business architecture skills and understanding by the business community is slow to develop. It is still mainly influenced by IT-resident proponents attempting to engage and educate their business counterparts. Information and data architecture are mostly thought of as the same thing in many companies. Information/Data management initiatives are gaining more business support and ownership, but focus tends to be on building better data warehouses and databases, than on actually architecting the overall information ecosystem as a guide for how to manage the information assets of the company. Big data and analytics are increasing visibility for information and data architecture, yet most organizations are fragmented and building their approaches not from a coherent business/information architecture perspective but instead using tools to assemble solutions from the bottom up. Technology, or infrastructure, architecture seems to have stabilized for most companies. Fewer dedicated resources are allocated to the development and documentation of infrastructure architecture, as it tends to be entrusted to engineers, who have grasped the concepts of standardization and reuse more than any other domain SME’s. Application portfolio rationalization is still often viewed as an EA responsibility. Absent business architecture perspectives, it will continue to yield only low-hanging fruit. Security and risk management are moving closer to the inner circle of EA concerns. Alignment between the EA and security communities is still not strategic in nature and is mainly at the technology level. The EA Tools market has vastly improved; with more useful tools and more consumers. However, the EA Tools market is still muddy, lumping together tools capable of address true “Enterprise” architecture with those that are designed to model at the project architecture level. There are many more public domain and low/mid-range offerings available. The EA Tools vendor community has become increasingly focused on improving user experience to shorten the learning curves for their tools and on providing integration between strategy, EA and portfolio/project management offerings. Tools are increasingly available through a SAAS model, making it easier for companies to acquire and use the tools. EA documentation is increasingly migrating into in-house document repositories. Organization of that material and ease of use by external parties is the number one challenge. The demand for the role of enterprise architect continues to be high, yet it continues to be difficult to locate and hire individuals with the experience, core soft skills and business savvy to fill those positions. 9 out of 10 jobs labeled and advertised as enterprise architecture are not true EA roles, but are for lower level solutions architects. Hiring managers are confused about the role or are not sure what they need. Consistent with that observation, 9 out of 10 resumes received for enterprise architecture postings are submitted by solutions or technical architects. Increasingly, maturing EA teams are incorporating business architecture concepts and are beginning to make the connection to the portfolio planning process. The most savvy are using business architecture to reinvigorate stalled or nascent EA practices. While rising practitioners are seeking certifications and training in the profession, growth in relevant soft-skills and business acumen continues to trail. The structure and makeup of an ideal EA team continues to be a question from chief architects. The work asked of an EA team by management, even if not for true EA, is the main factor in staffing decisions. No single model has emerged as dominant. Even when formerly given the role of enterprise architecture, most teams are challenged to find the necessary cycles to fulfill the strategic elements of the role. Enterprise architecture teams are increasingly aware of the need for virtual EA team membership with external SME participation. Few are able to motivate external parties to actively participate. There is stronger understanding of the need for integration between strategy, EA and portfolio. And while there is not appreciably better execution on this front, there is more effort to do so. Roadmaps are broadly viewed primarily as an EA deliverable, even though they are the product of collaboration with a planning team. These roadmaps are often built incrementally from work at hand vs. a longer-term future state-based perspective. Roadmap development is an opportunity for EA teams to “connect the dots” between strategy, business architecture, IT architecture and the portfolio planning perspectives. Governance processes and mechanisms are still mainly focused on compliance, with a disproportionate amount of resources consumed by design review and oversight, reviewing and creating new standards on the fly. Agile development approaches are slowly beginning to become aware that IT Architecture standards have some value and accelerate their work. Frameworks don’t make any more/less impact than they used to; even though the content and quality of the frameworks themselves seems to have improved. TOGAF has emerged as the most often recognized framework and certification for IT architects. IASA is in the game, with a focus on training and profession for IT architects. Others are mentioned less often. Thanks to all our Clients, Colleagues, Partners and Friends! EAdirections is looking forward to many more years of helping companies improve their effectiveness, the industry becoming less confusing, and the available resources proving to be more helpful.